EA have revealed the details of Star Wars Battlefront’s $50 (USD) season pass, along with some information on the game’s Hero Hunt mode. Did you get chance to try the beta? 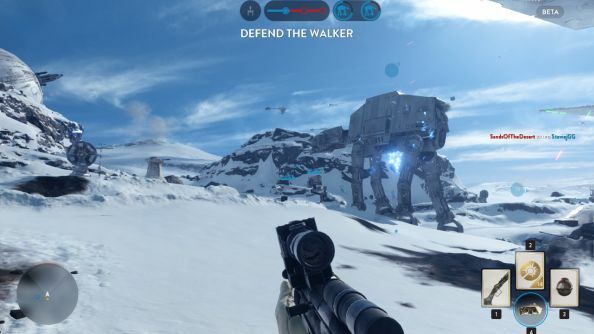 Why not read our impressions of the Star Wars Battlefront beta. The season pass includes four expansion packs, as well as early access to each bit of content by two weeks. You also get an exclusive ‘Shoot First’ emote. Chances are, buying the season pass up front will save you a bit of money compared to buying all the content as it arrives. However, $50 seems like a lot when you don’t know what you’re getting. If you aren’t worried about paying for invisible things, though, you can grab the season pass on Origin. Meanwhile, Hero Hunt sounds like it could be a lot of fun. Plus, it’s a chance to get some training in as the hero characters so you can really let rip when you get control in the larger game modes. Each Hero Hunt match begins with a player spawning as a hero or villain, which varies by map, and seven other players spawn as normal troops and have to hunt them down. Whoever kills the iconic character – be it Luke Skywalker, Darth Vader, Boba Fett, Han Solo, or whoever – then takes their place and the chase begins again. I might actually learn how to deflect blaster fire with my lightsaber in this mode. Star Wars Battlefront launches on November 17.